I was meeting a friend for dinner the other day and she said she needed to run to Pottery Barn Kids first to pick up a baby shower gift. Trying to be helpful, I offered a few choice pre-owned items I had tucked away. Really, cheap? What about, environmentally conscience, frugal…thoughtful? I’m going to go out on a limb here and say I am pretty certain that babies don’t really care if their things are second hand. I know the trend is to have more gear than less when it comes to our new offspring. I certainly felt more prepared for parenthood wrapped in a protective cocoon of Bumbos, Boppys and Baby Bjorns. Until I actually had our daughter and then I realized that no gadget on the planet could have really prepared me for what lay ahead. I had my first child when I was 35. What that means is I had quite a few years of buying completely inappropriate baby shower gifts, like teeny tiny Harley Davidson leather jackets, 3-inch long Air Jordans and bows larger than baby’s head on stretchy bands. What is it about adult clothes in miniature that is so appealing to the childless? I love buying baby gifts then and still do now. But, I hope I have learned a little over the years about gifting useful items. Since The Simple Year started I have been giving gently used collections of board books. Now board books don’t have quite the baby shower squeal inducing power of a minuscule tuxedo, but I believe they will get quite a bit more use, at least until Kindle comes out with a baby version. I’ve been gathering them at garage sales and thrift stores. I find the books for about a dollar each which is not only environmentally friendly but a pretty significant monetary savings since they are usually anywhere between five and eight bucks each when new. I give them a quick wipe down with vinegar which I’m not sure does anything, but it makes me feel better. I would hate to introduce bubonic plague into any of my friend’s homes. I add a ribbon and they are good to go. She meant generous of spirit, not generous with money which is what I prefer to believe. 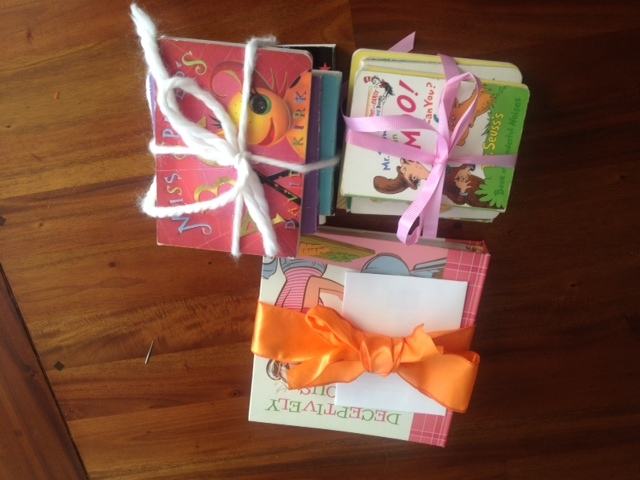 A collection of eight books for a first time Mama and a found copy of Deceptively Delicious for a friend that just had her third (I LOVE ours).